Body Tightening Concentrate was formulated for gravity-fighting body zones including the abdomen, buttocks, thighs, knees, and upper arms. 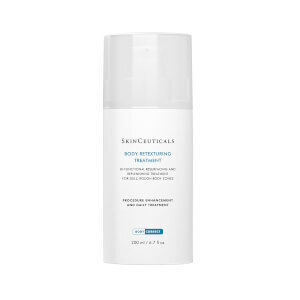 This cooling fluid stimulates collagen and Glycosaminoglycan synthesis to re-inflate skin, resulting in a smooth, tight surface. Unlike immediate superficial tightening treatments, Body Tightening Concentrate targets sagging loose skin from within for long-lasting lifting, firming and resilience. Increases Hyaluronic Acid production to increase volume. Leaves skin firmed, toned and lifted. Twice daily, apply a thin layer to affected body zones, or as directed by a skincare professional. Aqua, Water, Eau, Glycerin, Alcohol Denat., Dimethicone, Cyclohexasiloxane, Pentaerythrityl Tetraethylhexanoate, Dimethicone/Vinyl Dimethicone Crosspolymer, Menthyl Lactate, Polyacrylamide, Pentylene Glycol, Microcrystalline Cellulose, Phenoxyethanol, Ammonium Polyacryldimethyltauramide, Ammonium Polyacryloyldimethyl Taurate, C13-14 Isoparaffin, Panthenol, Faex Extract, Yeast Extract, Extrait De Levure, Capryloyl Salicylic Acid, Xanthan Gum, Hydrolyzed Rice Protein, Polymethylsilsesquioxane, Triethanolamine, Laureth-7, Cellulose Gum, Methylsilanol Mannuronate, Rosmarinus Officinalis Leaf Oil, Rosemary Leaf Oil, Disodium Edta, Adenosine, Dimethiconol, Tocopheryl Acetate, Tetradecyl Aminobutyroylvalylaminobutyric Urea Trifluoroacetate, Limonene. Love SkinCeuticle's products but been using this one for about 3 weeks and so far I'm not impressed. Not seeing much, if any, change in my skin.. I'll keep using it but at this point don't think I'll be re-ordering another bottle . This is my second bottle and love this! I use it on my neck and can tell a difference in my neck, it's not a miracle but it does make a difference. I use this twice morning and night.It smooths out my creepy skin and makes it lookPresentable. When I don't use it I can see the difference.I wish it were a little less expensive as it does not last long. Bought this for my crepey arm skin, used it every night and morning and didn't see no improvement what so ever. I don't use estrogen since menopause and read up I could be losing collagen as I get older. Also read all these so called lotions and creams won't do a thing for this problem but certain foods will help re-build up collagen in your skin. Well needless to say I wasted $78 and should of returned sooner for a refund!